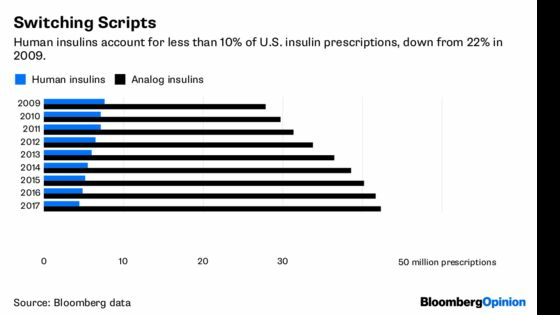 (The Bloomberg View) -- The researchers who pioneered insulin injections for diabetes sufferers in 1922 were dedicated to making the life-saving treatment widely available, and gave away their rights to profit from the discovery. Yet almost a century later, the medicine is still beyond the reach of roughly half of the 100 million people around the world who need it. Governments should be asking why, and doing something to put this right. Insulin is still expensive because the three major producers — Novo Nordisk, Eli Lilly and Sanofi — have been granted patents on the drug as they have incrementally changed it. First they derived the hormone from animals, then from humans, and most recently from recombinant DNA techniques. With each small advance, the price has gone up. The advanced formulations are meant to work faster or longer, but they’ve been shown to offer little or no advantage over the basic alternatives. Yet they cost nearly six times as much. On average, patients pay less than $8 a vial for human insulin, and $45 a vial for the analogs. Nevertheless, in developed countries, doctors are widely prescribing analog insulin. In the U.K., analog insulin now accounts for three-quarters of the total supply, up from just 11 percent in 2000. A similar shift in the U.S. has tripled the annual insulin bill since 2002, to $15 billion. Unfortunately, many doctors in low- and middle-income countries have done the same. The World Health Organization has declared that the cost of high-tech insulin outweighs its potential benefit, because governments cannot afford enough of it for all the people who need it. In sub-Saharan Africa, only 40 percent of countries provide insulin of any kind at public hospitals and clinics. Children born in the least developed of these countries who have type 1 diabetes have a life expectancy of less than one year. Governments could save money by purchasing only simple human insulin from smaller drug companies, but they have been reluctant to challenge the big three in the face of the companies’ vigorous marketing. As a first step, they should arrange for competitive bidding. Nine countries in the Caribbean have collectively saved money on insulin in this way. Governments can lower prices further by reducing their own taxes and customs duties on imported insulin. They should also try to encourage drug companies to create cheaper copies of branded insulins, as patents on existing medicines expire over the next five to 10 years. Here, the WHO could help by creating a prequalification process to vet potential competitors and guide national regulators as they evaluate and approve new products. Also needed in many countries are coordinated efforts to better distribute insulin to avoid the kind of unnecessary regional shortages that force people to buy higher-priced drugs from private retailers. The world’s shortage of insulin, with all the harm it causes, is an avoidable problem. Closer attention to value for money could ensure an adequate supply of affordable insulin to treat everyone with diabetes worldwide.